Note: The species formally called “Paraphysa parvula” is now to be called “Euathlus Parvulus.” Paraphysa is no longer valid. This article has been amended to reflect this change in taxonomy. The Euathlus parvulus (formally Paraphysa parvula), or “Chilean Gold burst” as it’s commonly referred to, is a beautiful little T from Chile. Reaching a medium size of around 4″, these tarantulas generally have a calm, sweet disposition. 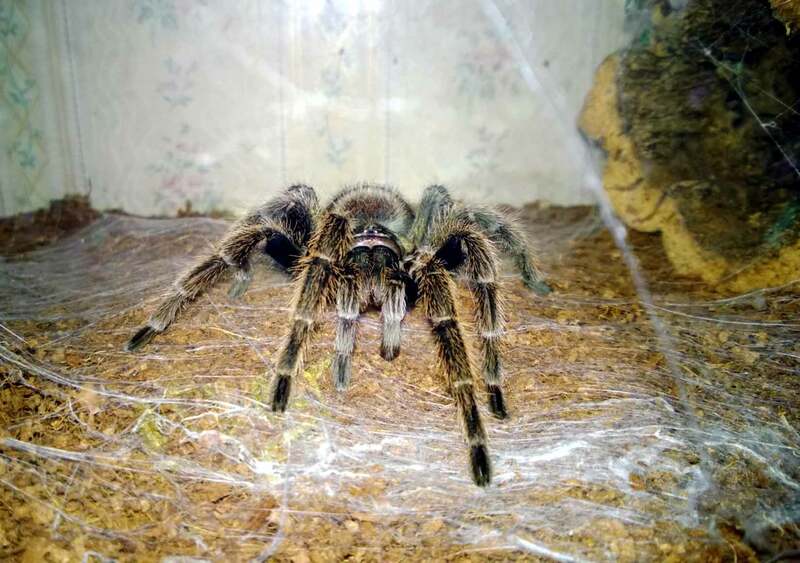 I purchased my girl as a sub-adult from Jamie’s Tarantulas in October of 2013, and she has become one of my favorites. My 3.5″ female P. parvula. I keep my E. parvulus identical to how I keep my G. porteri. She is housed in an 8″x8″x16″ acrylic cage with bone dry coco fiber substrate, and water dish, and a cork bark hide. Temps for her high 70s during the day and a drop to high 60s/low 70’s at night. This T does well in lower humidity, and does not warrant overflowing the water dish or moistening the substrate. Her behavior would likely earn her the dubious title of “pet rock”, as she enjoys just sitting out in the open in one spot for long stretches of time. Very occasionally, she will actually use her cork bark for a day. Still, there is something about her calmness that I rather enjoy, and she’s the only tarantula I own who I would describe as dainty. Check out my girl in the video below. I once read a forum post in which a E. parvulus was referred to as “a typical big brown spider.” Not true at all, although I would concede to truly appreciate the beauty of this species, you need to get them under a light. In the right lighting, E. parvulus sport some amazing colors and distinguishing features. This spider’s carapace is a stunning gold, lending the inspiration for its common name, and its legs sport white hairs that give them a shimmering silvery appearance. The abdomen is covered with reddish hairs that rise in a series of diagonal ridges converging on a mirror patch. As evidenced by the photo below, E. parvulus are anything but a plain brown. A 3.5″ P. parvula under the light. Notice the very striking and varied tones. Although I can’t speak for slings, my female is a great eater and has yet to refuse a meal. I currently feed her a variety of items, including crickets, superworms, dubia roaches, B. lat roaches, wax worms, and meal worms. She hasn’t demonstrated a preference, as she quickly snatches up whatever is provided to her. For those looking for a more active T, the E. parvulus’ sedentary lifestyle might be a bit of a turn off. However, those looking for T with a gentle disposition, easy care requirements, and a pretty appearance would find a P. parvula to be a welcomed part of their collection. A note about “At a Glance”: The temperatures and humidity levels listed are what mine is most often kept at and are in no way meant to be be “ideals”. The humidity in my home can drop to the teens in the winter or be as high as 90% during the summer. Congrats!!!! I love this species, and you don’t see them available much around here. How big is she? While over at Kelley’s down in Pueblo to breed my P. cambridgei yesterday, I got the chance to handle one of these. 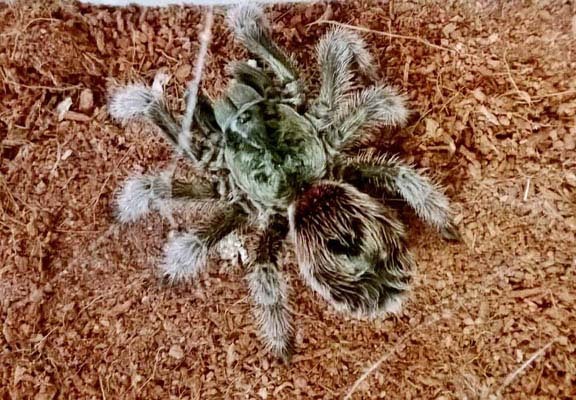 And..this is one of the prettiest freakin’ tarantulas I’ve ever seen. Not the gaudy “blow your eyes out” kind, rather just a masterpiece of subtle coloration throughout…and that abdomen. damn. Also for the “handlers’, this behaves very similarly to the E. sp. red when out and about. I’m going to order one of these as the next T in the collection ASAP.